Rather than reprint the entire Product Primer, this Glossary of Truck Terms condenses all that knowledge. Angle: The angle between the kingpin and the axle pivot point. If the kingpin intersects the vertical plane of the axle above the axle, it will tend to be less responsive – or squirrelly – whereas a truck with a lower angle will be more flexible. 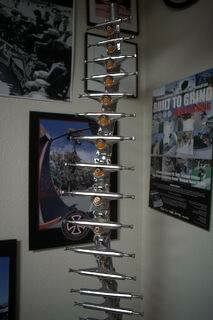 Axle: A metal rod – usually steel – that runs through the hangar and provides a threaded mount for bearings and wheels. Most axles are made of steel. Axle nut: A threaded nut that screws onto each end of the axle to hold the wheels in place. Base plate: A usually metal plate that is fastened to the bottom of the deck with four or six holes. The baseplate has a pivot cup and a socket for the kingpin. Bearing: Round metal balls that allow the wheels to turn on the end of the axle. Skateboards in the 50s, 60s and into the 70s used loose bearings. Sealed bearings were another innovation of the 1970s that followed closely after the introduction of urethane wheels. Bushing: Doughnut-shaped pieces of rubber or urethane that surround the kingpin. Each truck has two bushings, one above where the hanger fits onto the kingpin and one below. Cushion: Plastic bushings around the kingpin. Formerly known as “rubbers” from the roller skate days, these bushings were made of urethane and other plastics in the 1970s. In general, a rule of thumb: the softer the cushions, be they urethane or rubber, the more responsive the truck will be. Hard cushions will result in a more rigid, but stable, ride. Hanger: The piece that holds the axle and fasten to the base plate. Most hangers have a socket which allows the kingpin to pass through and be fastened/adjusted. The hanger also has a pivot point which is toward the center of the board. Hangers are usually made of aluminum alloys, with traces of other metals, such as magnesium. Some of the “price point” trucks had hangers made of zinc. Many truck manufacturers stamped their company name on the hanger – but alas, not all. Heat treated: Die cast metals tend to be porous. Air bubbles inside the part come to the surface during the heat treatment process. Heat treated alloys have a greater strength and ductility (or ability to withstand flexing forces) than non heat-treated alloys. Kingpin: Paraphrasing Steve Cave at about.com: “The name ‘kingpin’ gets used a lot for a lot of things, but usually carries the same meaning – a piece that holds the whole thing together. For skateboard trucks, the kingpin is the threaded bolt that runs through the center of skateboard trucks, and holds the trucks together. The kingpin runs through the hangar and two bushings, and then directly into the baseplate. Most kingpins are a fat hex-headed bolt, but there are many kinds of kingpins out there. Kingpin nut: A nut on the top of the hanger, which keeps the hanger and bushings in place and can be adjusted to make trucks more stable, or looser, as you wish. Pivot cup: A plastic-lined socket on the baseplate of a truck which supports the hanger at the pivot point and allows a truck to be turned right or left. Profile: Also known as “geometry,” the concept refers to the design relationship between the various components. The profile is the shape of the truck. In general, a narrower, taller truck will be more responsive in maneuvering – desirable for a freestyle rider. A low profile truck will be more rigid and stable for bowl or slalom. Sand cast: One method of molding truck parts. The molten metal is poured into a sand cavity, allowed to cool and then the sand falls away. Richard List of Lazer sand casts his hangers and base plates: “The problem with die casting is that the higher grades of aluminum that we use don’t work with die casting.” Sand casting is also slower than die casting. T6: ‘Heat treated to T6’ simply refers to the fact that heat is applies to the casted part, enough to the point where the part has a tensile strength equal to a standard unit of measurement, in this case known as T6. In the beginning, there was Sure Grip and Chicago and Roller Derby and other trucks made for roller skating, that skateboarders adapted in the 1960s. As steel wheels became clay wheels, the trucks also improved, but those trucks were still made for roller skating. Petitbled patented the first inline roller skate in 1819. James Plimpton brought out the quad roller skate in 1863. Chicago and Sure Grip shoe skates were fixtures in the market from the 1930s on. 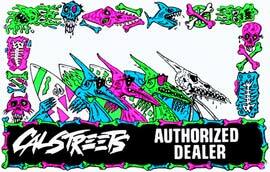 Sidewalk surfers used to find those clunkers, cut them down, and separate the trucks. Mark Richards was a skater from North Hollywood, California who had the hubris to call up the Chicago Roller Skate Company and suggest that they sell him separate trucks on mounting plates. It took the Midwestern roller rink businessmen months to understand what he was getting at, but they finally relented, and the first designated skateboard truck came to the bazaar. This brilliantly simple move in 1963 helped permanently establish Richards’ fledgling Val Surf as an industry leader. Along with Mark Richards and Val Surf, there were other attempts to make custom trucks for skateboarding during the clay wheels era – see Leesure Line – but the foundries of industry didn’t really get bubbling until the urethane revolution of the 1970s demanded more!As 70s skateboarders pushed urethane wheels higher, faster, steeper, deeper and more vertical, they demanded more from their trucks. And we all know what necessity inspires. An ad for Leesure Line from Quarterly Skateboarder in the 1960s breaks down the basic components of a skateboard truck. 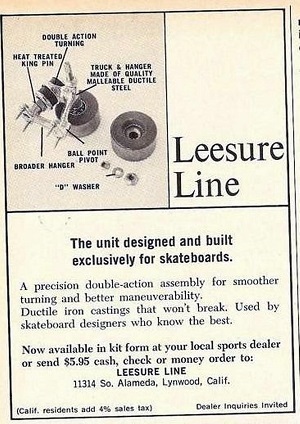 Leesure Line did not make it to the urethane revolution of the 1970s. But many other companies reputable and fly-by-night rushed in to fill the void. Image courtesy Surfer Publishing Group. 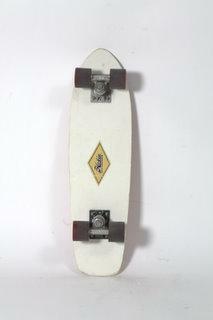 By the 1970s, trucks were beginning to be made with other specific skateboard-centric design attributes. Mr. Bennett sold trucks out of his Rolls Royce. The Bahne brothers made a truck. Dave Dominy created a wider truck for slalom called Tracker. Gull Wing die-cast their lot and used cooling fins that were highly reminiscent of 1930s Elgin bicycle hubs. These were the leading brands in a rapidly growing market. Others include Lazer, Excalibur, California Slalom and ACS. The circus of skateboarding was well populated by a thousand other fly-by-night jokers, toy makers and opportunists. 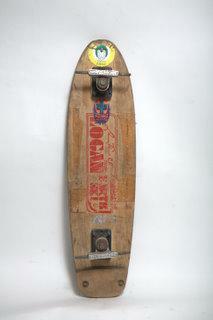 Mr. Bennett was the first in the 70s to make trucks for skateboards and the new performance demands of urethane. Board courtesy Santa Cruz or Terry Campion or Bill’s Wheels. Ask just about any question in the skateboard industry about “Who was on it first” and it will start arguments/fist fights/lawsuits But there is almost no debate that Mr. Ron Bennett was first to make a skateboard truck designed specifically for 70s skateboarding. According to an interview with Mr. Bennett in Concrete Wave Magazine in the Fall of 2006, the story went like this: Mr. Bennett’s son Brian got a skateboard for Christmas, 1974. He didn’t like the way it turned. Mr. Bennett found the problem was “simply a short wheelbase steering system on a long wheelbase vehicle.” He wondered why no one had made a truck specifically for skateboards. With a background in architectural engineering and an interest in machining, he researched steel alloys, rubber compounds, thermoplastics, aluminum alloys and foundry casting – pulling information and talent from the ailing, early-70s aerospace industry. He called his product “truks” as opposed to “trucks” to be different and save keystrokes. His goal was to make a “truk” that was lightweight and heavy duty, and also “unbreakable.” The base plates broke, but he replaced them every time. Mr. Bennett also began producing Alligator and Super Alligator urethane wheels. Bennett got out of the skateboard industry in the 1980s, when the Hobie licensee – one of his biggest accounts – filed for bankruptcy and NHS began distributing only Independent trucks. In 1975 Bennett produced the Bennett Hijacker. It was truly different from traditional trucks. The kingpin was placed well below the axle. This meant that skaters would not have to worry about the kingpin dragging on the ground. The parts were of high quality: Bennett used aircraft-quality locknuts and a special compound for his “rubbers” (the part that fits between the kingpin and the axle). The only area where Bennett’s trucks seemed to have a problem were the baseplates – they tended to break. Fortunately, the baseplates came with a guarantee – you could mail them back to Mr. Bennett and he would replace them for free.